I am almost finished with my corduroy pants, but I have a little left on them. I did however make this jersey dress last week. I had it cut out a while back, and when I finally started to sew, it was quite easy to make. The pattern, BurdaStyle 05-2010-103, is originally for woven fabric, but it worked fine with the rayon jersey I had got on sale earlier this year. I allowed myself to get some knits when they were on sale, because I didn´t have any in my stash, and I knew I wanted to make some knit tops and dresses. They are so comfy during the autumn and winter months! Inspired by the magnificent Carolyn, I made a little collage trying out different ways I could wear this dress. It´s so easy to get stuck wearing it just in one way! Pattern type: Dress with shirring. Rating: Easy, and great for beginners. 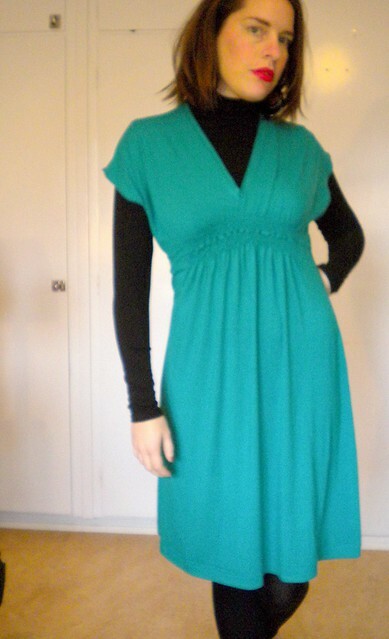 Pattern Description: Knee-length dress with shirring in the front. Were the instructions easy to follow? I didn´t use the instructions much, as I had read on PR that they were a bit confusing. What did you particularly like or dislike about the pattern? I love how easy this dress is to wear! Fabric Used: I used a rayon knit bought at Ohlssons Tyger in Sweden. Pattern alterations or any design changes you made: I omitted the sleeves, and made a narrow zig-zag hem instead. I didn´t include the ties in the back either. And the dress is supposed to be lined, I omitted that too. I finished the neckline using this excellent tutorial. Because of the stretchy material I used, I had to take the dress in considerably in the side seams, but that was easy to do, and didn´t affect the overall design, IMO. Would you sew it again? Would you recommend it to others? I might make this again, as I have mentioned before, this is just one of those dresses that is so easy to wear, and I love other people´s versions in chiffon as well. I´ll absolutely recommend this! Conclusion: An easy to make, easy to wear dress, I can see this becoming a wardrobe staple in the coming months! I love the color! The collage is a great idea. I like it with the pink shrug. This is one of those dresses that looks so much better on than in the technical drawing. I love how you styled it so many different ways! The dress looks nice in all the different styles and I agree with Sigrid that it looks better than in the drawing.The colour looks gorgeous! So pleased that you found a copy of the Perry Ellis skirt too! This looks great in jersey and from your collage it is a really versatile wardrobe piece too. The dress looks great – I love the colour on you and the versatility. I like the collage too. I can see this being a winter wardrobe staple. Wow! This dress is definitely a winner. I love all the “versions” of your collage, it was a great idea. Fabulous! Knit dresses are one of my fav things and yours looks great. I love the different ways you’ve styled your dress, looks like you’ll get plenty of wear out of it. I love your dress and the different ways you have styled it!